Before I say anything else, I want to make it clear that the real answer to this question is beyond the scope of this article; indeed, it is beyond the scope of mortality and all things temporal: for “this is life eternal, that they might know thee the only true God, and Jesus Christ whom thou hast sent” (John 17:3). Furthermore, “it will be a great while after you have passed through the veil before you will have learned [all the principles of exaltation]. It is not all to be comprehended in this world; it will be a great work to learn our salvation and exaltation even beyond the grave (Joseph Smith, History of the Church, 6:306-7). I am now able to attempt a basic answer to the above question. One of the most profound statements that will act as a beginning to our answer was made by the Prophet Joseph Smith. He said, “It is the first principle of the gospel to know for a certainty the Character of God” (Teachings of the Prophet Joseph Smith, comp. Joseph Fielding Smith. Salt Lake City: Deseret Book. 1938. 345). Because “character” means both “attributes” and “nature” (Cf. Gordon B. Hinckley. Faith: The Essence of True Religion. Salt Lake City: Deseret Book. 1989. 20-27. ), in order to know God and thereby receive eternal life, we must learn of both his divine attributes and his divine nature. For “Knowledge of divine and spiritual things is absolutely essential for one’s salvation” (Bible Dictionary, “Knowledge,” see also Romans 10:14). There has been much written regarding God’s divine attributes, so in this article I will attempt a short explanation of the other meaning of character, one that is seldom spoken of—the divine nature of God. I have already stated that it is “the first principle of the Gospel to know for a certainty the Character of God.” In addition, “If men [and women] do not comprehend the character of God, they do not comprehend themselves” (Teachings of the Prophet Joseph Smith, comp. Joseph Fielding Smith [Salt Lake City: Deseret Book Co., 1938], p. 343). This is because “All human beings—male and female—are created in the image of God. Each is a beloved spirit son or daughter of heavenly parents, and, as such, each has a divine nature and destiny” (The Family: A Proclamation to the World. Salt Lake City: The Church of Jesus Christ of Latter-day Saints. 1995.). The reason men and women are created “in the image of God” (Genesis 1:27) is because “The Father has a body of flesh and bones as tangible as man’s; the Son also; but the Holy Ghost has not a body of flesh and bones, but is a personage of Spirit” (Doctrine and Covenants 130: 22). This is the basic, corporeal nature of God the Father and His Son Jesus Christ. God the Father, His Son Jesus Christ the premortal Jehovah, and the Holy Ghost are three separate and distinct personages (Cf. Jeffery Holland. The Only True God and Jesus Christ Whom He Hath Sent. Broken Things to Mend. Salt Lake City: Deseret Book. 2008. 208-214.). “If the idea of an embodied God is repugnant, why are the central doctrines and singularly most distinguishing characteristics of all Christianity the Incarnation, the Atonement, and the physical Resurrection of the Lord Jesus Christ? If having a body is not only not needed but not desirable by Deity, why did the Redeemer of mankind redeem His body, redeeming it from the grasp of death and the grave, guaranteeing it would never again be separated from His spirit in time or eternity? Any who dismiss the concept of an embodied God dismiss both the mortal and the resurrected Christ. No one claiming to be a true Christian will want to do that” (Ibid.). It is easy to come to the conclusion that Jesus Christ, the Son of the Eternal Father, has “a body of flesh and bones as tangible as man’s,” for He said so Himself (Cf. Luke 24:39). Jesus the Christ was resurrected, and to be resurrected means “the uniting of a spirit body with a body of flesh and bones, never again to be divided” (Bible Dictionary, “Resurrection”). There were many who touched the palms of His hands, felt the nail prints in his feet, and thrust their hands into His side (Cf. John 20:27, 3 Nephi 11:14-15). It is also easy to come to the conclusion that the Holy Ghost “has not a body of flesh and bones, but is a personage of Spirit. Were it not so, [He] could not dwell in us” (Doctrine and Covenants 130:22). Hence His name is the Holy Spirit. However, to say that God the Father has “a body of flesh and bones” is a bold statement, especially when considering some seemingly contradictory statements found in the New Testament. One of the most perplexing of these statements is given by the Savior Himself: “God is a Spirit: and they that worship him must worship him in spirit and in truth” (John 4:24). This passage is often taken out of context. In John chapter four, the Savior was teaching the woman of Samaria how to worship. He was not giving her a discourse on His Father’s corporeal nature—or lack of it. But out of context or not, just because God is a Spirit does not mean that he is only a spirit and not anything else. Indeed, “man is spirit” (Doctrine and Covenants 93:33), and God is, therefore, a Spirit in the same sense that we are spirits—namely a spirit body clothed with a physical body (Cf. Ether 3:9). Finally, the common translation of this passage (John 4:24) is in error. A more complete version of it was given to the prophet Joseph Smith by revelation and confirms that the Savior is teaching how to worship, “For unto such hath God promised his Spirit. And they who worship him, must worship in spirit and in truth” (JST John 4:26). God’s body is, of course, different from ours. It is immortal, perfected, glorified, and resurrected. And because Jesus the Christ was resurrected and has broken the bands of death, all who have ever lived and will ever live on the earth will also be resurrected and receive their bodies after they die–bodies that are immortal, perfected, and glorified. The the most faithful will receive celestial bodies (Cf. 1 Corinthians 15:22, 40-42). , in bringing to pass “the immortality and eternal life of man” (Moses 1:39). Joseph Smith said that “the fundamental principles of our religion are the testimony of the Apostles and Prophets, concerning Jesus Christ, that He died, was buried, and rose again the third day, and ascended into heaven; and all other things which pertain to our religion are only appendages to it.” Jesus the Christ is central to everything. He is “the way, the truth, and the life” (John 14:6). It is “by him, and through him, and of him the worlds are and were created and the inhabitants thereof are begotten sons and daughters unto God” (Doctrine and Covenants 76:24). He was resurrected from the dead and He and His Father did not only show themselves in vision to Stephen during his martyrdom (Acts 7:56), but They also appeared to the boy Joseph Smith, early in the Spring of the year 1820. Of Them, the Prophet declared that he “saw two Personages, whose brightness and glory defy all description . 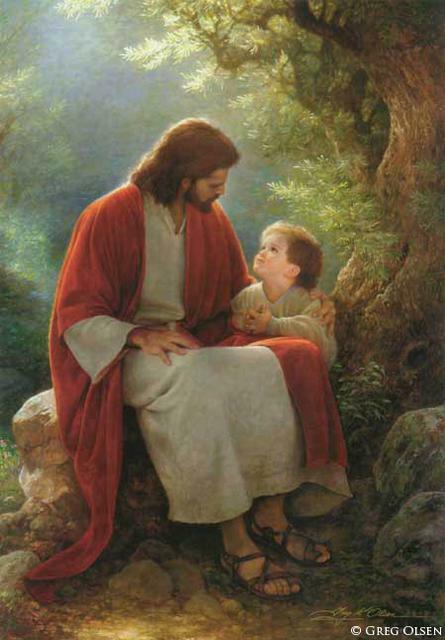 . . One of them spake unto me, calling me by name and said, pointing to the other—This is My Beloved Son. Hear Him!’ (Joseph Smith History 1:17). This article is beautifully written and I am deeply touched as it has helped me understand my Savior and God much better, thank you.